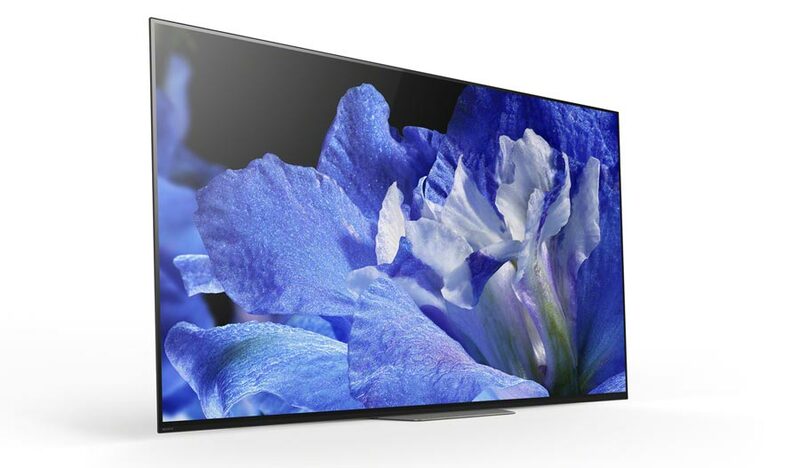 At CES, Sony has announced its 2018 OLED TV. A8F – AF8 in Europe – features 4K resolution, Dolby Vision, and Acoustic Surface audio technology. Sony says that last year’s A1 OLED has been ”extremely well received by customers and reviewers“ so why change a formula for success? The new OLED model builds on many of the technologies first introduced with the A1 OLED last year. 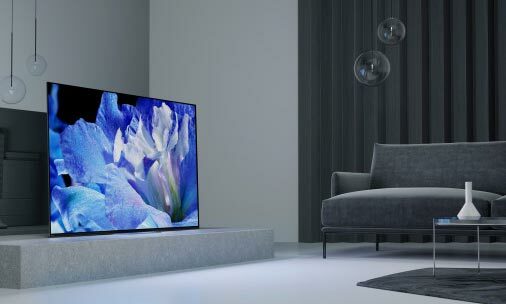 - “The new AF8 (A8F) series has inherited Sony’s unique 4K HDR picture processor-X1 Extreme, and the Acoustic Surface technology to give not only high visual quality but awe-inspiring sound,“ Sony said. Last year’s A1 OLED will carry over into 2018. The new model extends the OLED line-up. X1 Extreme is Sony’s video engine that supports multiple HDR formats, including Dolby Vision, whereas Acoustic Surface is the innovative audio technology that uses the OLED panel as a speaker membrane to have sound emanate directly from the screen itself – no speaker units required. The A8F is built on a 2018 OLED panel with 4K resolution with pixel-precise luminance and color control for “incredibly detailed picture with deep blacks, rich and realistic colors and an exceptionally wide viewing angle”. It also has a refreshed design “with a minimized stand that allows it to be positioned in a wider range of locations“. Sony will in 2018 continue to use Google’s ‘Android TV’ operating system in its TVs. The platform lets you explore apps, movies, games, and more from the Google Play store. A8F also come with built-in Chromecast and other Google features. The new OLED range from Sony is entering a market for OLED TVs that stands to become more crowded in 2018 as several first-tier and second-tier brands enter the field. 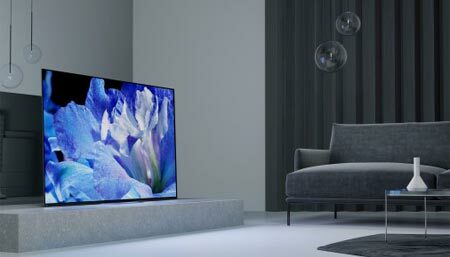 LG, Panasonic, Philips, Grundig, Loewe, Bang & Olufsen, Toshiba, and others also sell OLED TVs. Sony A8F / AF8 will be available in 55 and 65-inch sizes this spring. We are still chasing more information and pricing details. Features OLED as display device. 8 million self-illuminating pixels bring a significantly enriched visual experience with unprecedented black, authentic color, and a wide viewing angle. Features 4K HDR Processor X1 Extreme providing the ultimate 4K HDR viewing experience by incorporating three technologies: Object-based HDR remaster, Super Bit Mapping 4K HDR and Dual database processing. Features Acoustic Surface technology: the entire screen resonates with great sound emanating directly from the screen itself. This allows a perfect unification of picture and sound that conventional TVs cannot deliver. Features vibrant, expanded color with TRILUMINOS Display, further enhanced for color accuracy. Uses 4K X-Reality PRO to produce stunning detail with Sony’s unique algorithm of reality creation database for any content, such as TV broadcasting, DVD, Blu-ray Disc, Internet video and digital photos. The minimalist design: AF8 series has a clean, minimalist design that keeps you focused on what's important – the picture. The new design with a minimized stand allows the AF8 to be positioned in a wider range of locations. Android TV lets you explore a world of movies, music, photos, games, search, apps and more. Voice Search to find content, ask questions and control your TV. With Chromecast built-in, you can easily send content from your smartphone or tablet to the TV. With access to Google Play, you can enjoy your favorite movies, TV shows, and games on your TV. HDR compatible to receive and process the new video standard signal with higher brightness, higher contrast and more vibrant colors via Internet video services and HDMI. Supports HDR10, HybridLog-Gamma and Dolby Vision (future firmware update).